Artists Rep's installation and performance "Caught" flirts with the boundaries of fact and fiction. Is it "real"? Who do you trust? Why? 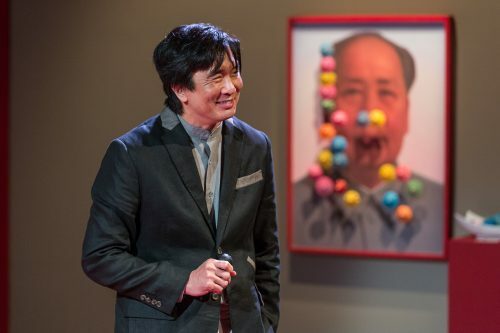 As I walked into Artists Repertory Theatre I was greeted by the sight a Chinese man dressed as Chairman Mao, surrounded by dozens of automated maneki-neko (those little cat-statues you find at Chinese and Japanese restaurants). Together, they stared off into the mid-distance and waved, all slightly out of synch. The effect was strangely welcoming and unnerving at the same time. This is how Caught begins, a facsimile of Chairman Mao. A lie. This was not the only lie the evening held. An usher handed me a guide for the gallery, attributed to Chinese artist Lin Bo, and encouraged me to take in the exhibit before the house opened. Throughout the lobby were Meditation Stations for the Consumed, circular curtains of blank price tags viewers could walk into and contemplate their existence as cogs in the machine of capitalism. Up on one of the walls was an interactive installation called Cloud Memory, which projected text messages from participating audience members onto a rustling field of white sequins. By now it should be apparent that Caught is not a traditional theater performance. Nor a traditional art show. The visual art works in tandem with the performance, creating a space that opens the audience up to being led somewhere new. After exploring the lobby I wandered into the theater itself, where the exhibit continued. A field of tall grass, composed of hundreds of green chopsticks, stretched out across the back of the stage, and portraits of Mao, which you could cover with cheap trinkets, were hung along the walls. In the center stood a huge frosted glass cube. Concealing something. While the installations focus a lot on consumerism and commodification, the experience also questions the idea of truth. Once the audience is seated and the performance part of Caught begins, how we construct truth and to what end becomes the central question of the show. If a journalist says something as true, do you believe it? What about an artist? Is there even such a thing as “truth”? The theatrical elements of Caught, written by award-winning playwright Christopher Chen (this, like everything else in this artistic hall of mirrors, may or may not be an actual fact), revolve around characters struggling to discover, and sometimes control, the truth. Interestingly, this struggle is often centered on Chinese-American identity, highlighting the ways in which race and nationality create truth. But this is not a traditional theatrical piece, and the show’s narrative takes some abrupt turns. Chen’s script – performed by Greg Watanabe, Dmae Roberts, Sara Hennessy, and Chris Harder, with Shawn Lee as director of record – is constructed like a maze; a few key lines come back and repeat, capturing that feeling of being lost but thinking you’ve been here before. The structure amplifies the sense of being unmoored as the show goes on. The actors embrace the increasingly presentational feeling of the show while still grounding their work in the humanity of their characters. Watanabe in particular brings an effortless charm and tenderness to his performance. If it feels like there’s something I’m not telling you about Caught, you’re right. Don’t take it at face value: There’s a hidden conceit to the show. But discovering that conceit is what makes Caught compelling. Artist Rep has created a unique theatrical experience that pulls the rug out from under the audience and leaves them questioning everything. That’s the point. Whether truth actually exists or not, the only way we’re going to find it is to question everything. Caught continues through Oct. 29 on the Morrison Stage at Artists Repertory Theatre. Ticket and schedule information here.